Proposition #7 – Kent Hovind, Virgin Islands Underground Coal Miner? – Kent Hovind v. Robert Baty – The Great Debates! 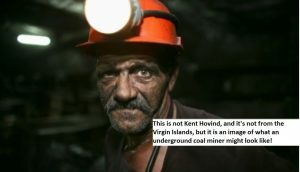 Home→Proposition #7 – Kent Hovind, Virgin Islands Underground Coal Miner? Kent has often claimed that his official IRS transcript of account has him identified as an “underground coal miner in the Virgin Islands”. As with so many of his complaints, which his people have apparently accepted and repeated, Kent has yet to come forward with the evidence supporting such a claim. So we have Proposition #7 in our current list of 62 propositions for discussion if Kent ever come out to me or sends his Champion. The IRS had Kent Hovind labeled as an “underground coal miner in the Virgin Islands”. That was about 3 weeks ago. Yes, it is a serious matter, and, in part, its seriousness may be indicated by Kent’s years’ long refusal to put up the evidence on this most simple of factual claims.